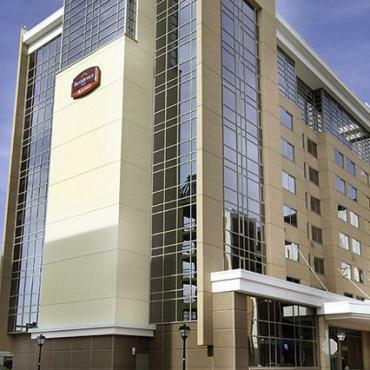 Located on Brambleton Avenue in downtown, the Residence Inn by Marriott Norfolk Downtown offers ideal accommodations for short or long-term stays. When traveling or relocating to Norfolk, you'll find great amenities at our downtown Norfolk hotel. For extended stays in Norfolk, enjoy spacious suites 25% larger than traditional hotel rooms. Our suites offer separate living, eating and sleeping areas, free high-speed Internet, and full kitchens. Enjoy complimentary hot breakfast daily, a weekday social hour with food and beverages, grocery shopping service, heated indoor pool and fitness center. Residence Inn, a Marriott hotel in Norfolk, is close to Sentara Norfolk General Hospital, Children's Hospital of the King s Daughters, EVMS and Norfolk Southern. Food, shopping, and entertainment surround the Norfolk hotel with Chrysler Hall, Scope, the Ted Constant Convocation Center and MacArthur Center Mall nearby. Our well-trained team will help make your stay a pleasurable one.